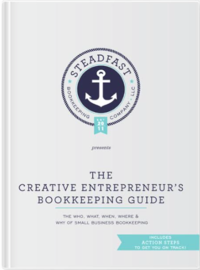 Ten Biggest Bookkeeping Mistakes Small Businesses Make - Steadfast Bookkeeping Co.
I’ve been working with small business owners for a long time now and while every business is different and has its own personal needs, there are always some similarities that I see over and over again. One of these similarities are the mistakes that have been made when it comes to their bookkeeping. There are a few things that I see that just never surprise me. Why? Because when we start our businesses, nobody hands us a big book of do’s and don’ts. We do the best we can, we take courses, read articles and hope for the best. Honestly though, sometimes we fail, right? Not on purpose, not because we aren’t intelligent but truly just because we weren’t made to do every little task in our business and bottom line we just are knowledgeable about certain areas and THAT’S OK.
You guys, for the first 3 ½ years of my biz, I had a website that I created myself. Thank God that thing has been replaced with my current one which was done by an amazing professional because it was bad. If there is a list out there of “mistakes a business owner makes when trying to DIY their website”, guaranteed I probably hit everyone of those mistakes. Seriously. I’m just not good at that kind of stuff and now I no longer mess with it. I can make small updates here and there but trying to make it look nice and cohesive or adding a code…no thank you, not for me. Doing it yourself with no support! Now, here’s the fun part! I’ve been working on some great resources for y’all and I’ve decided to include these mistakes along with the “how to avoid them” as a bonus in my first e-book launching next month! So, if any of these mistakes resonate with you for any reason and you want to know how to stop making these mistakes or how to never make them in the first place, stay tuned because you are in for a treat. « When is it time to pursue your business full time?